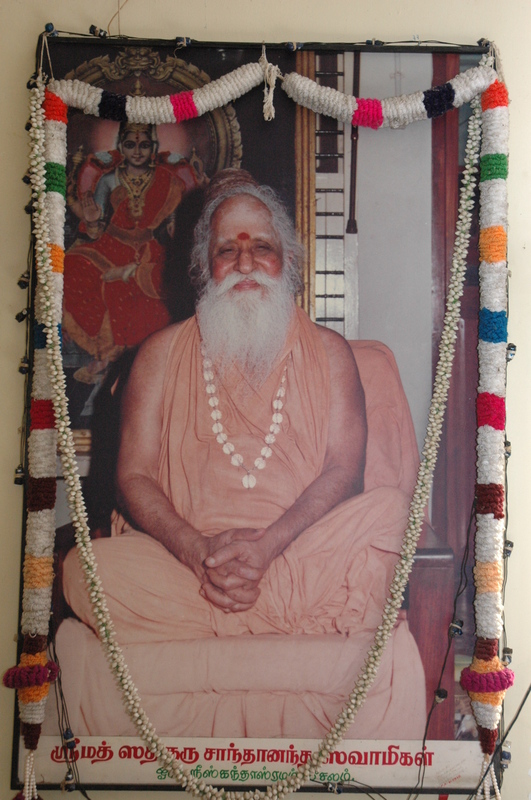 Shri Santhananda Swamigal and Shri Chandrasekara Bharathi Theertha Swamigal of Sringeri. The time AdiyEn (I) was fully engaged in the Nanganallur ‘Adhi VyAdhihara’ Sri Anjaneya Swami Alaya nirmANa kaingaryam (temple construction works). (The year 1994). The noontime of a Saturday in the month of Kartikai. Sitting in rest after the meal at home, I fell into a short sleep involuntarily. At that time Sadguru Sri Santhananda SwamigaL who appeared in my dream with a smiling face asked with the privilege of intimacy, ” enna dAsanE (what, my devoted servant)! It is a long time… since you are seen near Skandasramam! Have forgotten it?” and then disappeared. I woke up with a jolt. My mind was filled with bliss. I started on that very evening. Stayed at Salem for the night. Was at the Skandasramam on the morning of the next day (Sunday). A divine laughter on the face of Sadgurunatha who had spotted me at a distance! Raising my hands high above my head, I fell prostrating shAstAngam before SwamigaL. Looking at me with a smile for sometime without taking his eyes away, he blossomed his holy mouth: ” enna dAsanE , not at all seen before my eyes for many days together! What is it for today… looks like a wonder! Some soppanam (dream) came up yesterday?” Even before he could finish it, I felt perspiring and once again fell at his golden feet with a thud and got up! That Parabrahmam laughed. “Satyam GurunathA! Only after having a dream yesterday I have now come running! How come you…” before I finished he talked: ” EnDAppa (why my boy), why would it not be known? Only I came in your dream!” Saying this that dIrgha darshi (one with a foresight) laughed loudly! AdiyEn did not understand what to reply to that Deivam who knew everything. I stood in silence. “Today in the ukkirANam (kitchen), veN pongal (salt pongal) and brinjal kotsu (salad) have been prepared. First go there, and come back after finishing your tiffin!…” With supreme compassion, that God sent me away! When I returned finishing my morning tiffin, a large crowd for darshan of Gurunathar. Calling the people one by one and talking to them, he was sending them back. Leaning myself against a pillar, AdiyEn was watching it. Twelve o’ clock in the noon. The crowd had become less. Sadgurunathar gestured and called me. Getting up and running, I prostrated to him. “Nanganallur Temple works are going on in jarUr (briskness, swiftness)?” SwamigaL asked. “Going on, GurunathA!” I said. “On the date of 16th February, 1992, the yantra pratiShTA was held, GurunathA!” I said. “Yes Swami”, I said, surprised! “But then the pratiShTA yantram itself seems like that of pancha mukham (five-faced)!”, said SwamigaL. “Yes, GurunathA! What was installed in the AdhAra pITham (root base) was only the pancha mukha hanumat yantra “, I agreed with him. Sadgurunathar did not leave it at that. “Let that be. Three years ago… my remembrance is that it was in ninety… taking that yantram , with ten or twelve devotees, it seems you people went on yAtrA (tour) to many kShetra s (holy places) and even came to Skandasramam!”, that Parabrahmam asked smiling and raising his eyebrows. AdiyEn was in confusion! About the pratiShTA that took place and was over, why SwamigaL inquires with such probing questions, I was nervous, unable to understand it. SwamigaL continued: “See if one thing comes to your mind! As I received that large pancha mukha hanumat yantram and kept it on my lap, you know the experience I had? I shall now tell you, listen. I felt like sAkShAt pancha mukha Hanuman himself coming down as a shishu (infant) and sitting on my lap. It was a Yantra with such a jIva kaLai (pulsating life)! I read without missing anything, the grantha akShara s (Sanskrit letters) found on the Yantra surfaces. ‘With what shraddhA (care and faith) have they created this’, I felt very proud. ‘Who is the one that made such a wonderful Yantra’ I asked you at that time. “What you said at that time… ‘AnathANdavapuram Ramadas Aiyar and here, the man standing by my side, Marutthuvakkudi Sundaresa Josyar… these two people together prepared it’ is still in my memory! What, all that I say is correct?” SwamigaL asked. Standing amazed, I nodded my head with humility in agreement! I couldn’t think of anything to talk to him! Sadgurunathar himself continued: “It entered my mind that a prati (copy) of that Yantra which was parama sAnnidhyam (of supreme divine presence) should be there in our Skandasramam. Forthwith I told you, ‘Take a prati of this pancha mukha hanumat yantram and ensure it reaches me’. Nodding your head with vigour and only after saying, ” uttiravu (your orders), GurunathA” in happiness, you moved away! “The yantra pratiShTA was also over! But to date you have not at all given the yantra prati to me! I also know that it was not your mistake. A man who accompanied told you, ‘Ramani… We should not give to other people the Yantra we prepared exclusively for Anjaneya Swami. (Or else) its sAnnidhyam (divine presence) will lessen”, one person among you said it. I also know who is he!”, he said. Tears leaked from my eyes. My body shuddered! Falling at the holy feet of Sadgurunathar, I wept, sobbing. Before I could gather myself to speak something, SwamigaL himself said: “The elders say that dharmam to the poor and dAnam to the renunciate should be done. What am I going to do keeping that yantra prati ! If necessary, I shall use it for loka kShemam (welfare of the world), what else?” Saying this, SwamigaL called an Asramam official to come near him. I looked at it attentively. One is a handwritten copy of the Nanganallur pancha mukha hanumat yantram ! In the other sheet something was written in order in the grantha lipi ! It was not intelligible to me. “I know him very well, GurunathA”, I said. “If that be so, you do one thing. Go to Pudukottai and meet the elderly man Vaidheesvara SastrigaL. He knows these details! And he will tell you.” Saying thus, SwamigaL gave me leave to return. Prostrating and receiving prasAdam , I started my way back. That very evening, I was at the house of Pudukottai Dr. Vaidheesvara SastrigaL. I told him everything in great detail. Listening to it with interest, SastrigaL said, “This is a samAchAram (news) that is parama rahasyam (of complete secrecy)! Even then, since Sadgurunatha himself has sent you to know it, I shall tell you. You should also keep it in your mind only.” He cautioned and took me to the vAsal thiNNai (raised portico) nearby. As we sat there, SastrigaL continued: “A day three years ago… Sadgurunathar sent word for me hurriedly. I went to Skandasramam at once. There, taking me to a room privately, SwamigaL asked me to pick up a sheet of paper and a pen. Then he sat down upright, closing both his eyes. I was unnerved! As a jaTA makuTadhAri (with a crest of matted locks of hair), it looked as if sAkShAt Paramesvara was sitting! Without opening his eyes, he ordered, “Now you should write down in Samskrtam what I shall go on telling you, without missing anything.” Then he started telling, and I too took it down fast and finished it! Then as SwamigaL opened his eyes, I asked him, “SadgurunathA, what you told me now looks like the pancha mukha hanumat paramAna yantrottaraka shlokam (the root verse to write up the Yantra)?” Then he gave me all the details!” SastrigaL stopped to steady his breathing. I was impatient. “That is alright, SastrigaL… Did Gurunathar say anything about who gave him the yantrottAraka mUla shlokam of the Nanganallur pancha mukha hanumat yantram ?”, I asked with eagerness. To this question of mine, Dr. Vaidheesvara SastrigaL replied with tears leaking out of his eyes. Hearing this, I stood in amazement! I raised my hands high towards the direction where that Sadgurunathar stands tall as a living holy figure and worshipped him. 700 slokas constituting the Durga Saptha Sathi in praise of Goddess Chandi Durga (who is the personification of Mahakali, Mahalakshmi and Mahasarasvathi) are recited at the temple every day. Sri Panchamukha Anjaneya appears with 5 faces, ten hands and is 14 feet in height. His five faces are the embodiment of Lord Anjaneya in the east, Lord Narasimha in the South, Garuda in the west, Varaha in the North and Lord Hayagriva at the top. The five faces of the five Gods protects the devotees in five fold ways. Lord Anjaneya is a destroyer of enemies, Lord Narasimha is the remover of all kinds of Fears, Garuda is a remover of all kinds of ailments, Varaha is a bestower of Prosperity and Lord Hayagriva is a bestower of Knowledge. Thus he is seen as the very epitome of infinite grace and blessings to his devotees. The temple has a sannidhi dedicated to Goddess Bhuvaneshwari, the Universal Mother. The 6-foot stone icon radiates beauty, peace and grace. Goddess Bhuvaneshwari is regarded as Shrividhya or Lalitha Maha Tripura Sundari. It is believed that the 10 incarnations (Dasavatara) of Lord Vishnu emerged from the 10 fingernails of Goddess Bhuvaneshwari. She holds the noose to draw the devotee closer to her, angusam to rid the devotee of their sufferings. Her abhaya hastham confers blessings and prosperity to the devotee. One eye of Goddess Bhuvaneshwari who is one of the Dasamahavidya is regarded as Raja Mathangi, who bestows prosperity and erudition and the other that of Varahi- the Commander-in-chief of the celestial army, who protects devotees from all evil. The other Dasamahavidya deities Kali, Tara, Shodasi, Tripurabhairavi, Cinnamastha, Dhumavati, Bagalamuki, Rajamathangi, Kamalathmika are installed around the sannadhi. This gopuram represents the Tamilnadu type of architecture. Lord Kamala Siddhi Vinayakar, Lord Panchamukha Heramba Ganapathy, Lord Dattatreya, Lord Panchamukha Anjaneyar, Lord Sanieswarar, Lord Ayyapan, Goddess Ashtadasabhuja Durga Parameswari, Srimath Sathguru Santananda Swamigal, Lord Sarabeswara (form of Shiva), Goddess Prathiyankira, Goddess Bhuvaneshwari, Lord Swaminathaswamy (Skanda), Lord Maha Sudarshanachakathalwar, Lord Lakshmi Narasimhar, Lord Maha Sahasralingamurthy (1008 lingams), Lord Nandikeswarar, Goddess Annapurani and Sri Chakra Poorna Maha Meru all in a magnificent stature.